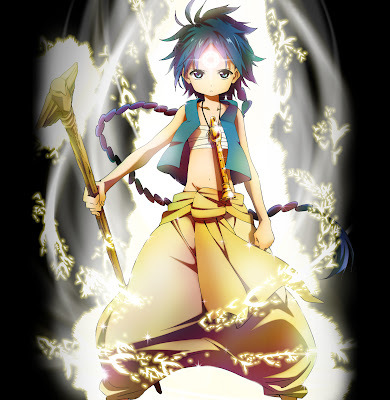 Magi is an Arabian Nights themed Japanese manga by Shinobu Ohtaka serialised in Weekly Shonen Sunday. Earlier this year it was announced that it would be animated and released for the autumn season. As mentioned this manga is inspired from Arbian Nights stories of One Thousand and One Nights. As a result most of the main characters are based from "heroes" from these folk stories. The "primary protagonist" we meet is Aladdin, a Magi, who travels around with a magic flute that summons a djin named Ugo. Obviously his name is based from "Aladdin and the Magic Lamp". Aladdin is a mysterious boy, who travels in search of metal vessels that contain other djinns. 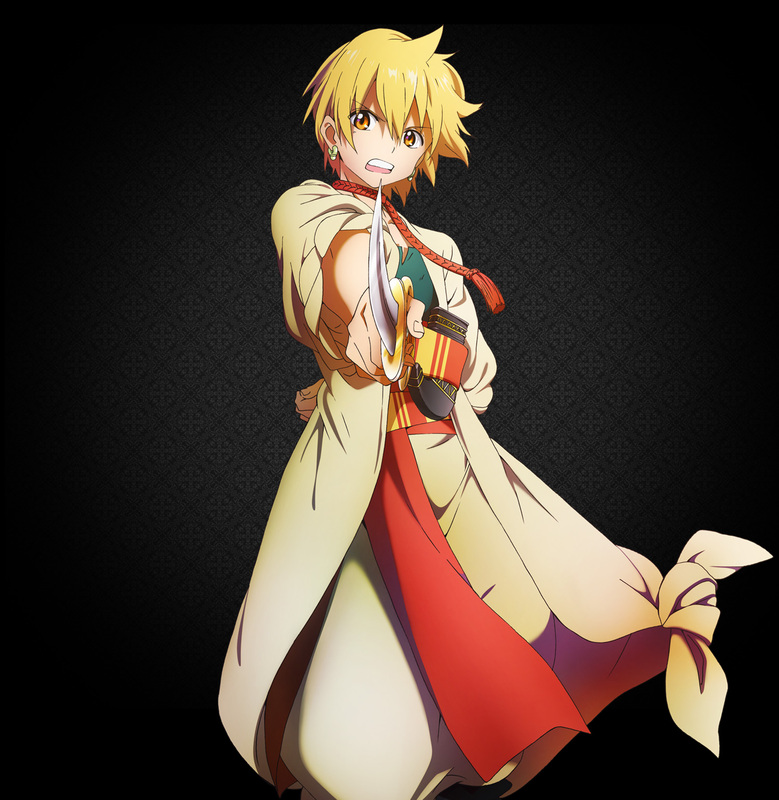 He has a pure and innocent, yet wise personality that dislikes fighting. Although he looks like a child, he has manly interests. As mentioned Aladdin is a Magi, which means that through mediating with his staff, he can communicate with the Rukh and gather the Magoi of Rukh for attacks. While travelling Aladdin meets with Alibaba Saluja. His name is based on "Alibaba and the Forty Thieves". Alibaba is a young man aiming to capture the 7th Dungeon "Amon" in hopes of repaying his debt. Aladdin joins him on his quest and together with Morgiana they successfully do so. Morgiana is a a red-haired girl and descendent of the hunting tribe "Finalis". Her name is based from the slave girl who served "Alibaba and the Forty Thieves". As she is a Finalis she is no normal girl. She possesses strong leg's strength which can enable her to climb vertical walls and move very fast, she also has a keen sense of smell. This was just a quick review on the main characters of Magi. The anime will be coming out some time in October of this year.